My Mag Magazine Blogger Template. After long time. 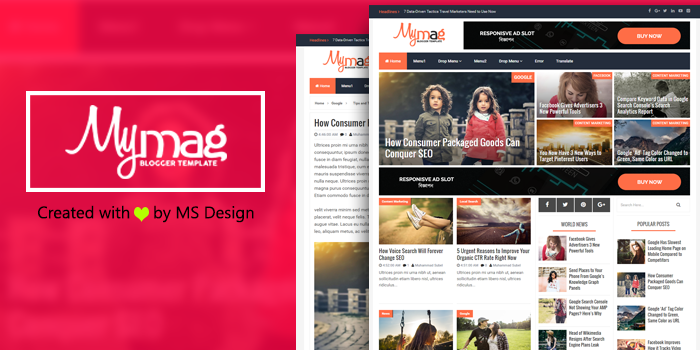 MS Design now sharing another blogger template after True Mag - Magazine Blogger Template. It was our last designed professional magazine blogger template. After that, now we're sharing another beautiful, professional and high quality Magazine blogger template. We named it My Mag. This is specially designed for micro newspaper blog or magazine website who running their blog on Blogspot platform. This is fist 3 columns designed blogger template by ms design. Please follow instruction on Documentation folder. Thank you. I have followed your documentation folder. But still feature slider is not working in my blog. Kindly check and reply me. I'm Noviar from Indonesia. Sorry, I want to try the free first. If it suits the heart, I will buy your template. Sorry, if any english i am not right. Because I use google translate.